I am laughing out loud at myself and thought I would share my self-deprecating humor with you. You see I have a problem. Actually I have had it all my life but today I think I am ready to admit it and do something about it. I subscribe to an already disproven-theory that “more is more”—unable to grasp the proven “less is more” concept. My friend Angela invited me to a luncheon at our condo. Guests were asked to bring a hooded sweatshirt in a gift bag for a child or teenager in our community. Simple, right? All I had to do was purchase one sweatshirt, any size, any color, and put it in a shopping bag with a little festive tissue paper and bring it to the luncheon. That is what the other 59 guests did. Here’s what I did: I went on-line and found a sweatshirt company. 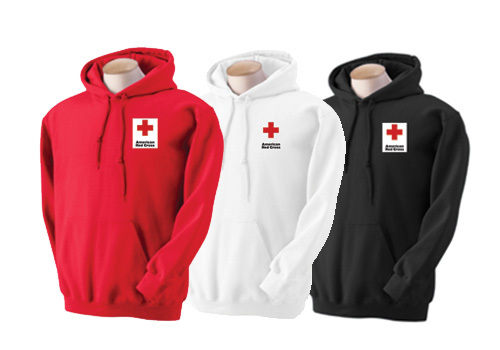 The sweatshirts were hooded, reasonable, and the display showed any color you could imagine. (Jiffyshirts.com). So I purchased 15—you read that correctly, not one, as the invitation suggested, not two, as any normal person might have done, but FIFTEEN hooded sweatshirts. I couldn’t help myself. And then I found another website and purchased 15 shiny red shopping bags, and hundreds of sheets of forest green tissue paper. I have enough green tissue paper to supply Macy’s for their holiday shoppers through 2013! This gets worse. I then called my son who works with some Major League Sports teams and asked him to donate some tee shirts and hats. He sent 10 shirts and 10 hats which led to the purchase of additional shopping bags. So by now you get the picture. I had 35 shopping bags to bring to the luncheon!!!!! Some of you may think I did this because I wanted to “out do” others. You are wrong about that. I did not walk into the luncheon with all of these bags, hoping others would notice. No way. That would be too over-the-top and frankly, I am embarrassed. Rather, I called Angela and asked to drop them off days earlier. I also asked her not to make any mention about my over-the-top purchase at the luncheon. No, I did not buy all the sweatshirts for notoriety; I bought them because I am out of control. While I am aware of my generosity here in helping 35 kids, this excessiveness is a pattern and the pattern is a problem. Whether or not I have the financial means for this excessive pattern is irrelevant. I began innocently enough, looking for one red Christmasy sweatshirt. I found it right away, but then the emerald-green caught my eye, as did the pink and orange ones, and it was all downhill from there. I just kept clicking and sending to my virtual shopping bag. The same excessiveness is evident throughout my life as in the dozens of flip-flops in my closet, the number of tennis outfits, and the amount of cans of crushed tomatoes in my pantry. If I like a particular pair of jeans, I buy three pair, find a new comfortable bra and I buy 12 identical bras. There are far too many examples to list. A woman who really feels good about herself feels good from within, not because of the display of shoes in her closet, the clothes she wears, or the amount of sweatshirts she brings to a luncheon. The high SUCCESSTROGEN level woman can be generous, but she is in control. Changing this pattern tops the list of my New Year’s Resolutions, and frankly may be the only thing on my New Years Resolution list this year. It is time to change this lifelong pattern. And how about you? Is there a pattern in your behavior that you wish to change? It all starts with recognizing it and wanting to change it, not for anyone else, but for you. I wish you well in your efforts to make whatever changes you wish to make to get to a better place.